At the top you can select either Back or Lay depending on the type of system you wish to test and choose to either calculate 5% commission into all winning bets using Betfair Starting Prices (BSP) or not. Once you have run a set of rules you can simply reverse the bet type by clicking either Back or Lay and applying the same rules again. If you think you have an idea for a backing system that shows a really bad loss, you can switch it and look at it from a laying point of view quickly and easily. First of all you need to start adding rules or adding groups. Most of the time you will select Add Rule (in green), which will bring up a blank box with a drop down list of categories to choose from. If you choose Add Rule, leave the 'And' button clicked as default, highlighted in the darker blue. A good starting point would be either a date or better still a date range. You can either click 'Race Date' which when you select a range in the second box, such as 'Greater or Equal', will bring up a Calendar which you can navigate to add the dates. Alternatively you can select 'Year' and be shown a drop down list of the last ten years to select from. From here just add as many rules as you want before running your system idea. If you want to select more than one category such as two or more Courses you need to select Add Group instead and then ALWAYS click the Or button. Once you have clicked Add Group, choose the category, such as courses shown here, then to add more courses to this group you need to click Add Rule again, inside this group and select the same category. You can see on the example that Ascot Or Epsom have been selected inside this separate 'group'. You can read more detail on adding a group at the bottom of the page. To get started click Add Rule and then you will see a blank 'Categories' box. Click this and the list of categories will show in a drop down list to select from. 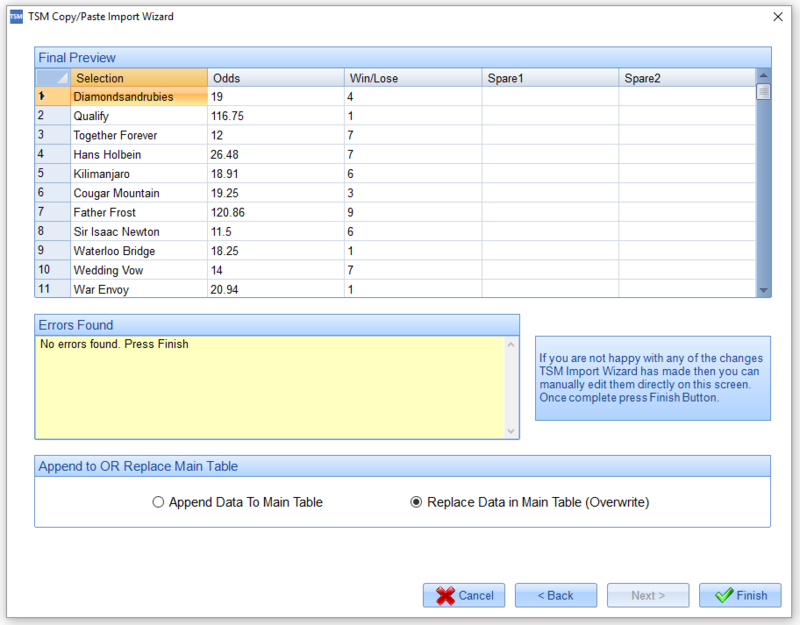 This selects the main criteria of form to use for your system rules. It is always best to start with a date or date range. You can see a list and an explanation of all categories in detail by clicking here. Equal to and only including this particular choice. 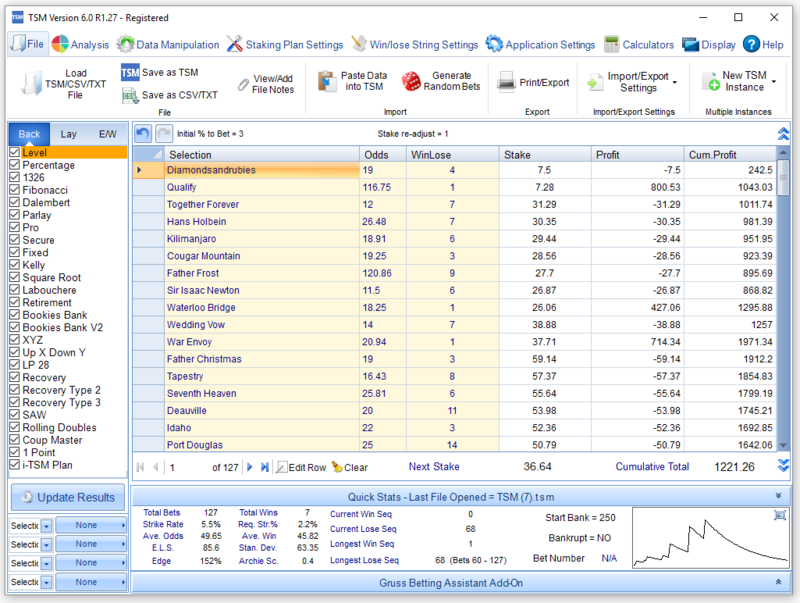 e.g equal to 5f races, will only show data for 5 furlong races and nothing else. e.g 2 this is probably the best one to use if you need to type a word or name such as a Trainer or a Jockey, a Horse or a Sire/Dam etc. You will need to ensure you have the correct spelling. We will have a list of Trainers and Jockeys added to the site in the future so that you can get the correct name but this will not be on the drop down as there are just too many. Here you can choose more than one value where a word is required, such as Jockey name or Horse name as long as they are separated by a comma. Same set up as above but if you want to exclude more than one text field from your results. Only those below a certain number or choice. Only those bigger than a certain number or choice. Greater or Equal: Similar use to Greater. 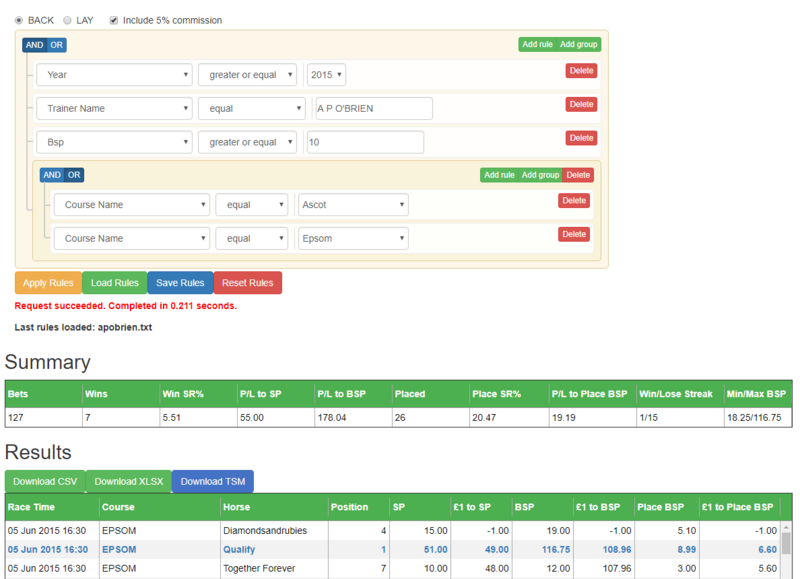 This is for when you want a range of results, such as a date range, price range and others. e.g if you want to see only those with a BSP of between 6 and 20, then choose Between and you then get two boxes to input 6 and 20. This will be inclusive of your choice so it will include BSP’s of 6 and 20 as well as all those in between. This means something that has nothing but really won’t be needed in many cases. e.g If you are referencing the ratings and choose ‘Is Null’ it will count all horses that had no ratings at all, so it would be their first race course outing. 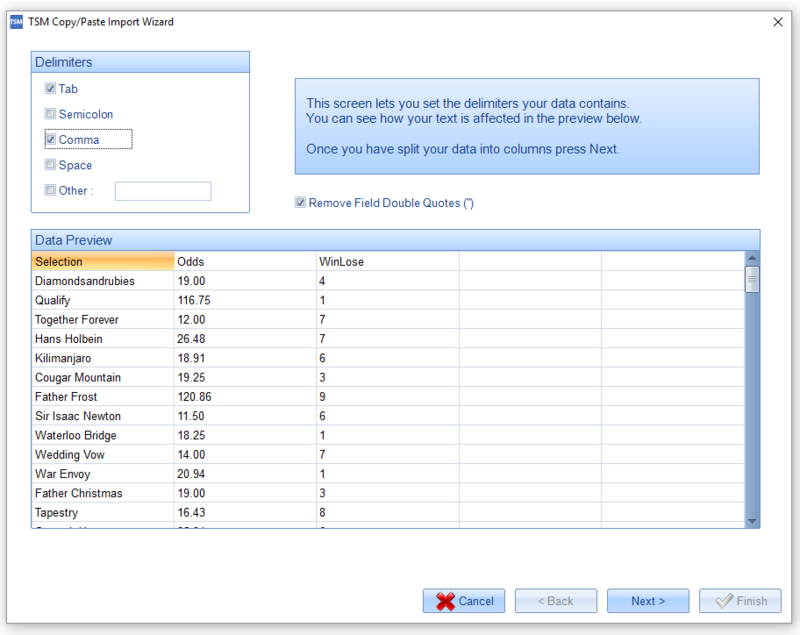 (You could also select the category ‘Previous runs total’ and choose ‘equal 0’). Just means there is a result, or data. e.g. if you want to look at Maiden races and are referencing the ratings, this will allow you to ignore horses that have not run before and therefor do not have a rating. e.g If you are looking for a word you are best using Equals and using the full, correct spelling. e.g 2, you can use this for the Race Title Category and search for race titles that Contain ‘Maiden’, or ‘Claimer’, or ‘Apprentice’ to use a full for these or other specific race types. You can also use it for words such s ‘Grand National’ or ‘Derby’ to find results from big races that occur each year. Ignore as would not be required on this product. 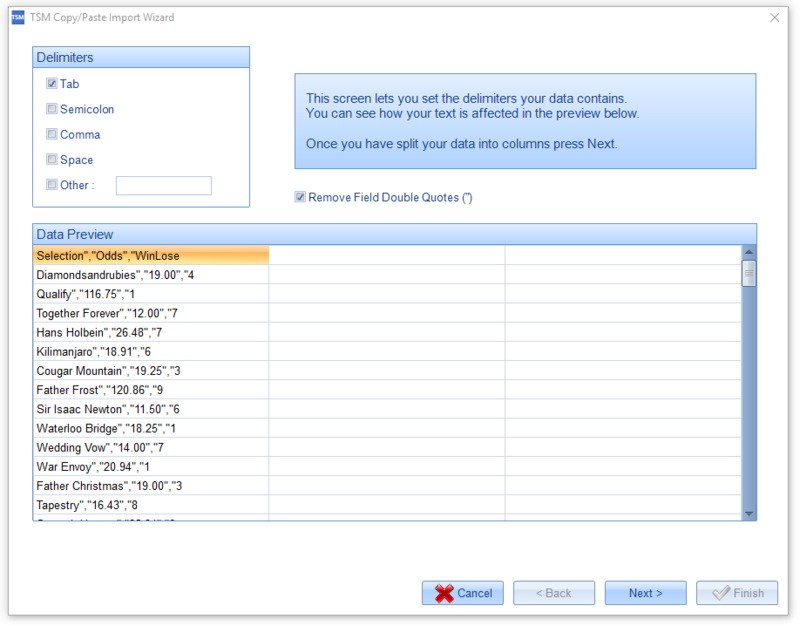 This is where you either select the values from a drop down list or select your own values. If there is no drop down list then you can either type in the values or if it is numerical use the up/down arrows on the right of the box. There are four functions below the form fields. Apply Rules: Click this to run the rules that you have selected. Load Rules: Load a saved set of rules and apply them again. Save Rules: Click here to save a set of rules you are happy with or would like to test again into a .txt file. Once you click here the file will be downloaded to your computer as a text file. Once it is downloaded, click File at the top of the saved box that opens and give it a name so you can remember it in the future. It may be best to start a new Folder on your computer to save all of your system ideas. Reset Rules: Click here if you want to clear the boxes and start again with a new system test. Below these you have the time that it took to complete the rules you have applied and if you uploaded a saved file, the name of the file you last uploaded. The number of wins. (7) If you choose to test a Back system, wins will be the number of horses that came first. If you choose to test a lay system, wins will be the number of horses that lost. The number of horses that were placed. (26). We use Betfair place rules for these so it depends more on the number of runners declared than on the actual number that ran. The smallest winning BSP in the set of results (18.25), and the highest winning BSP (116.75) If you have a really big highest BSP it can distort the final profits and it may be worth trying to set your rules to not count BSP's that are really high, to give you a better idea of the overall profitability of your system rather than make it look really good but based on one massive winner. All results are in date and race time order from the top. Horses that won are highlighted in Blue, those that were placed using Betfair place rules, are shown in Red. You can download the results into a csv file, an xlsx file and you can also download the results into a TSM file and test your system against many staking plans. TSM stands for The Staking Machine and is a piece of software that you can use to test a number of staking plans for both back and lay bets. You can download a file as a .tsm file and if you have the TSM software installed, you just click the file and it will automatically open the software and prepare your set of results to be loaded. To prepare your results correctly if you have the TSM software installed, follow the procedure below. 1. Click the Download TSM button, then click the file, (if you can't see this you should find the file in your Downloads folder). Then TSM will open as on the image below. The file saved has just three columns which are the name of the selection, the BSP price and the finishing position as Selection, Odds, WinLose. TSM will automatically take any horse with a 1 as it's position as a winning horse. Now you need to click the box for 'Comma' in the Delimiters box, click 'Next' and the data will separate into 3 set columns as below. Click 'Next' and you will see the box where you just need to change the number in the 'Remove Headers ?' box from 1 to 2, then click 'Next'. Now you have the final preview where it should say 'No errors found. 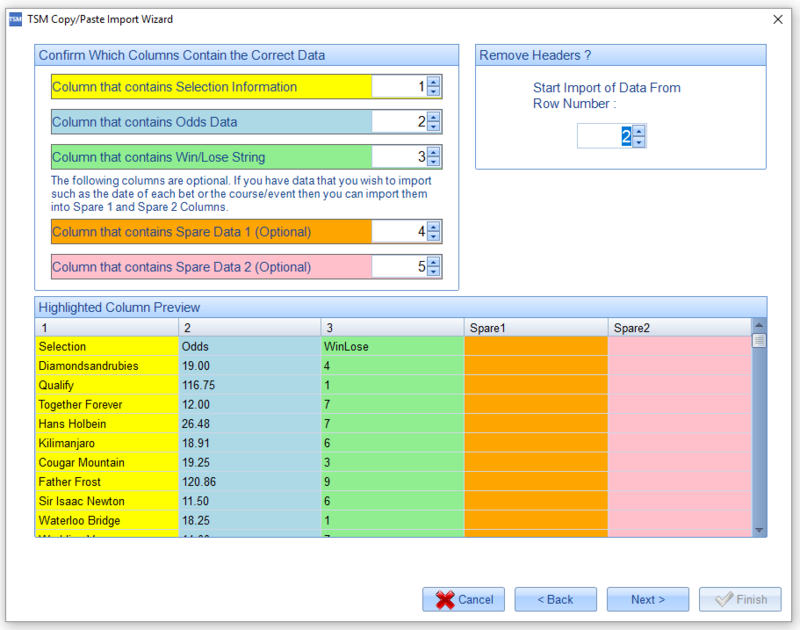 Press Finish' I would also suggest choosing the 'Replace Data in Main Table (Overwrite)' button as this clears old data and starts again with this new set of results. After you click Finish, you will see the results in the software as below. Here you can play around with all of the staking plans, settings and everything else that The Staking Machine provides. There are three categories that can be used to reference the speed ratings which are at the bottom of the categories drop down list. One is Ratings, which also includes Rating Rank, the other is Top Rated Clear By. All main speed rating columns can be used here and these are found on the Inform Racing speed ratings race cards. This is where you would reference an actual rating number or a range of rating numbers. For example you could run a set of rules and include all horses that had an average rating of 80 or bigger. Here you would select 'Greater or Equal' 80. ​This is the position the horses were ranked in order so top rated is the same as top ranked or rank 1. Here you can select only horses that were top rated (top rank), only those in the top 3, or those that were not in the top 5 for example. This only concerns the top rated horse in any of the columns. Here you choose how far clear of the second top rated horse you would like the top rated horse to have been. So for example you could look for horses that were 5 or more clear of the second top rated horse. So if a horse had a rating of 85, it would need the second top rated horse to have a rating of 80 or less to be be counted as clear by 5 or more. Adding a group. Some more details. 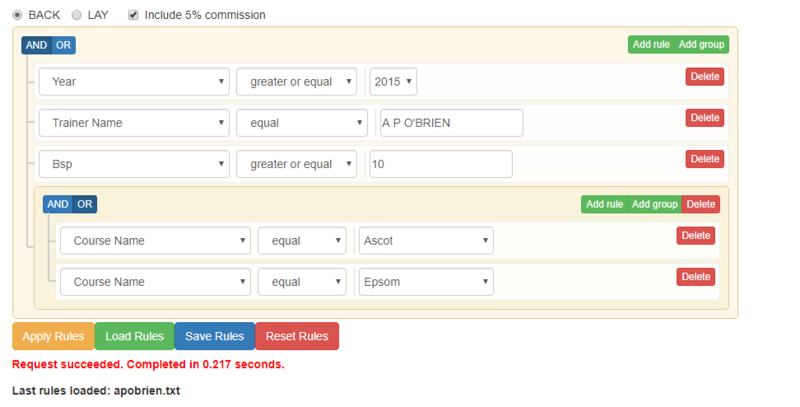 When you are adding a new category such as Race Distance or Horse Age, you will use the Add Rule button for each new addition and if you are selecting just one selection from each category then Add Rule will work perfectly. Some categories allow you to choose the operator, 'between' or 'less than' and others similar to these and as there is a list of options on the drop down list, you can choose more than one value. For example on Race Distance you can select 'between' 7f and 1m 2f, or 'less than' 1m and these will work perfectly. However,if you want to select 2 or more selections from some categories then you will need to select Add Group. Once you have a new group it will be 'nested' separately on the system builder and to then add more selections in that group you need to again Add Rule, to that group. You also need to make sure that you change Add to Or (in the blue boxes), when you have a Group, by clicking Or. So when you add a group it is more about nesting rules. For example, on Course Name you could say Course Name Contains 'A.W.' which does not need a group however, (Course Name Equals 'Aintree' OR Course Name Equals 'Ascot') which will require a group.